The morning in Arusha began bright and beautiful which was an omen for the day I think. An early breakfast, goodbyes to the boys and off to the airport for our flight to the Serengeti. 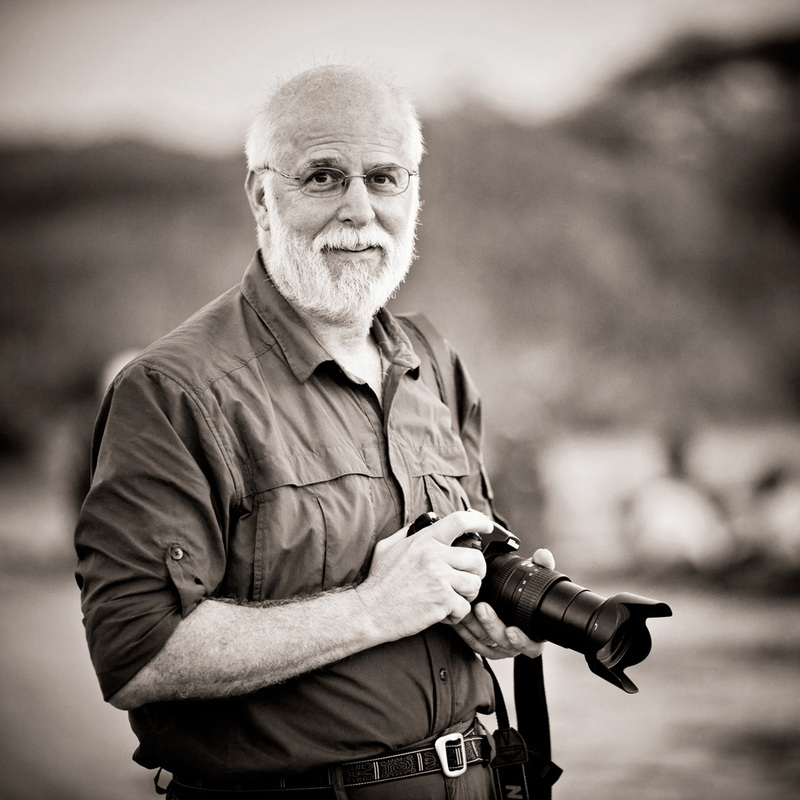 We were flying out of the small Arusha airport to the Kogatende Airstrip with a quick stop at the Lobo airstrip on our way to the Mara River. We were in a Cesna 208 with perhaps six other passengers and it was cloudy most of the way (unfortunate as we flew directly over Oldoinyo Lengai, or Mountain of God to the Maasai), but the clouds opened up the minute we hit the Serengeti and you could see forever. We disembarked (perhaps too formal of a word for having landed on a dirt airstrip in a single engine plane where the pilot helps unload the luggage) at Kogatende and met up with Abuu which is a good thing since we would have been totally stranded literally in the middle of nowhere if hadn’t showed up. Not 100 yards on to the road leaving we immediately ran across a scavenger festival which was occurring at the expense of a wildebeest that looked like it had died of natural causes. There were tons of white-faced and white-headed vultures with a half dozen Marabou Storks just to add some sense of total chaos to the situation. Needless to say it wasn’t very pretty, but ultimately part of the circle of life to quote the Lion King. We watched for some time and when we drove back by two hours later, the bones had been picked totally clean. 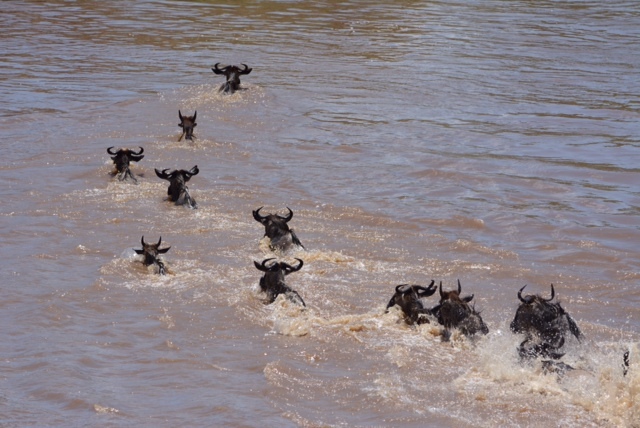 We drove along the Mara River looking at the various crossing sites for the wildebeest. They actually have the crossing sites numbered here which gives you some sense of the fascination with this aspect of the Great Migration. 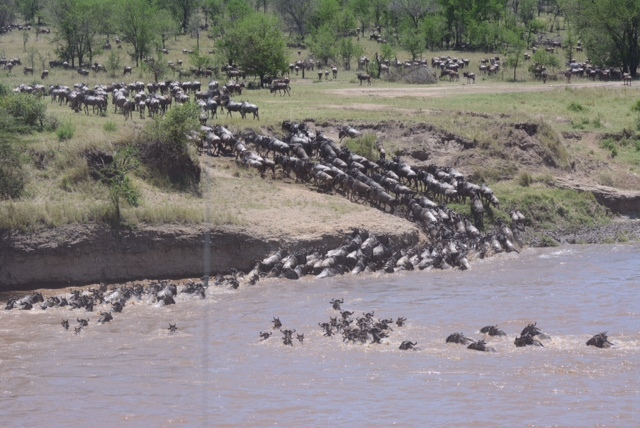 We sat with a large herd of wildebeest and zebras taking lots of photos and hoping they would mosey down to the river, but they really just kept moving back and forth without any apparent intention to satisfy the 10 or move vehicles hovering nearby. After waiting perhaps 1 to 1-1/2 hours (and eating our lunch of course as Danielle was hungry) we were sitting there with all the other vehicles when Abuu suddenly shot off like a bat out of hell and we were suddenly entered into what reminded me of an Oklahoma Sooner style stampede to the river to view the crossing. I must admit, though, that it was one of the most impressive sights I’ve ever seen. There were no crocodiles in the vicinity so everyone made it safely and in probably 20 minutes or so it was all over. We left the crossing area to drive along the Mara looking for other sights along the way. Lots of hippos everywhere. Some sunning themselves on the beach and others in the river. They have no natural predators so they have to little to worry them. 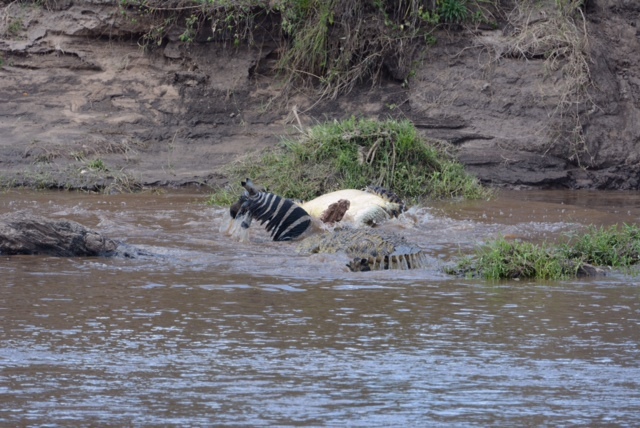 After a bit I spotted a zebra carcass lying in the river and when I took a closer look with my binoculars quickly realized that there were two huge crocodiles hastily disposing of it. And when I say huge, I mean really huge. They were at least 10 or 12 feet and probably more. They were playing tug of war with the carcass and then began to fight so between that and there death rolls there was quite a bit of action. As we continued our drive along the Mara and then turning south to head to our camp, we ran across a group of hyena displaying their bazar social behavior – there was a male and female mating for what seemed like forever with the alpha female (we’re presuming) protecting them from three other hyenas who were trying to break up the mating. 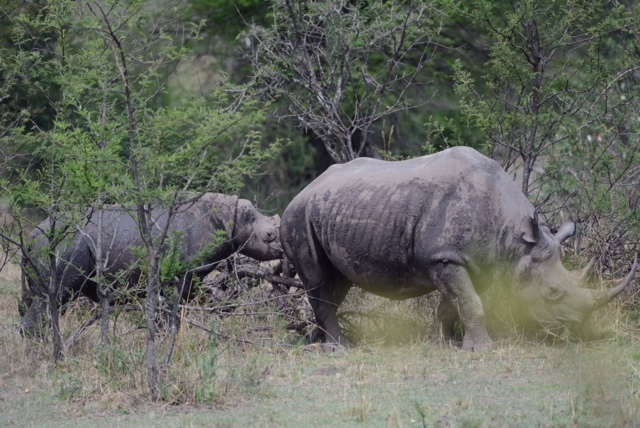 Abu said that the alpha female had decided who and when any mating would take place and between who. Pretty interesting social structure to say the least. We arrived to our camp just before sunset and got settled in our tent which is pretty amazing – much bigger than anything I expected and very, very comfortable. They actually have flush toilets in this seasonable camp which is a pretty amazing feat to say the least. In addition, their showers have both hot and cold water that they fill in separate buckets in the morning so you can actually adjust the temperature of the water rather than be at the mercy of the “cook” heating it on the fire. We had a wonderful dinner, relaxed a bit and hit the sack ready for new adventure in the morning.